Many older homes have asbestos tiles for flooring. As time goes by and homes get remodeled, you'll certainly find that fewer homes have them. But if you have a post WW2 home, there's a good chance that the tiles contain asbestos. Should you be worried if you have vinyl tiles that contain asbestos? The short answer is that, as long as the tiles are not disturbed in any way--removed, sanded, cut--there is little concern. Only by disturbing the tiles can the asbestos fibers be released into the air. Q: How can vinyl tiles have asbestos? Aren't vinyl tiles just made of vinyl? Today, yes. But in the past, vinyl tiles had asbestos mixed in with the manufacture. The aim wasn't so much to make them fireproof as it was to make the tiles more durable. Q: What is the time period for asbestos vinyl flooring? Q: Can you have asbestos tiles that aren't visible? Absolutely. One method of dealing with the asbestos problem was--and still is--to cover them with a second layer of flooring. This effectively encapsulates the asbestos and renders it safe--as long as it is not disturbed. As long as the asbestos tiles are solid, you can cover them with sheet vinyl, luxury vinyl plank, laminate, engineered wood, solid hardwood, and just about any other type of flooring. Q: Which brand names of vinyl tile might contain asbestos? Armstrong, Congoleum-Nairn, Ever-Wear, KenTile, KenFlex, Montgomery Ward, and Sears & Roebuck are some of the brand names of vinyl tile that might contain asbestos. Q: How can I find out the brand name of the vinyl tile? The safest and easiest path is to search for excess tiles left by the installers. If you have owned your house for awhile, it's almost certain that you would have run into these already. But if you have recently purchased your house, you might find these tiles secreted away in strange locations: in the triangular storage area below basement stairs, work sheds, crawlspaces, attics. Failing that, the back of a loose tile may identify the manufacturer and brand-name. Prying up vinyl tiles may stir up the asbestos, so I recommend only looking at loose tiles. Q: Can you narrow down specific makes of vinyl tile flooring that could contain asbestos? A prominent home inspectors' site Inspectapedia offers an exhaustive photo guide to potentially asbestos-containing vinyl floor tiles. Q: Can I have a lab test my vinyl flooring for asbestos? Yes. It's a far better option than trying to identify asbestos-containing tiles yourself. Local testing labs will test your vinyl tile for reasonable fees. To get an entire home tested for asbestos might run you $400 or more, but to test an individual sample of vinyl tile (if mailed or dropped off at the facility) would cost you about $40-$60, based on local Seattle-area rates. For the lab to come to your house and take the sample, you can triple the price. Taking a sample usually involves little more than cutting out a 1" square of the vinyl tile in question and sealing it up in a Zip-Loc bag. Q: How do I remove asbestos vinyl tiles? If at all possible, leave the tiles intact. All guides highly recommend against removing asbestos vinyl tiles. There are few instances where you actually need to remove your vinyl flooring before installing another type of flooring. One notable instance is if you plan to restore the wood flooring underneath the vinyl tile. But you can easily install ceramic or porcelain tile, laminate flooring, and solid hardwood and engineered wood over vinyl tile--without removing the vinyl flooring first. Any kind of grouted tile will require the installation of a cement backer board first. For laminate flooring, you may wish to smooth out the surface by first installing a thin plywood underlayment. Hardwood or engineered wood flooring may be installed directly on the vinyl flooring. Q: But I really want to remove my asbestos vinyl tiles! How do I do this? 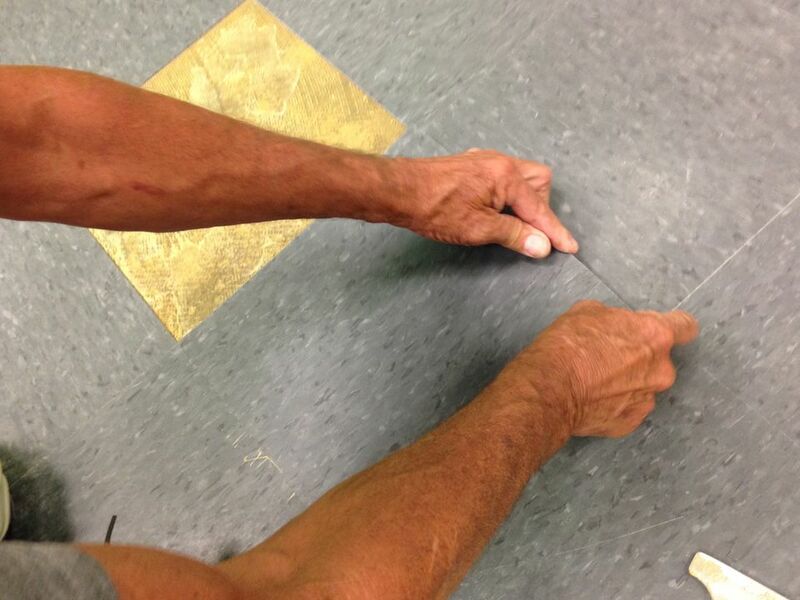 Seal the work area, protectively suit yourself up, and remove the vinyl tile while taking care not to break it up. This can be a hard thing to do with older vinyl tile, which will be friable and not flexible.